For those of you who are newer to the blog, you may not believe that before February 2012 I had not painted since school. She didn’t believe me. And she had planted the seed of self doubt in me too. Perhaps I could paint again… with the right person to help guide and unblock me, to hold my hand, but let me do it totally my own way. Two days later I discovered the most incredible painter’s blog, by chance… and spotted she was doing an e-course the next month. I took less than 24 hours to sign up! And the rest is history! 40 paintings flowed out over the next 2 months. I did my first professional exhibition. Got some cards printed. Then I really started following some dreams – I started to submit paintings of mine, as well as writings, to publications I love: Juno, Earth Pathways Diary and We’Moon… and they were accepted. 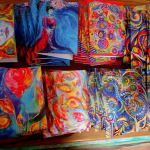 I have my own artist website with prints, cards and the originals for sale. And now I am receiving commissions. Other people believe that I can paint and am willing to pay me to paint their own visions. I have bloomed true, thanks to her. 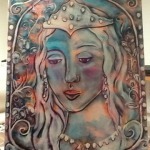 The artist’s name is Flora Bowley. 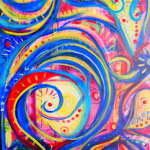 The course is Bloom True with Flora Bowley (for a whole selection of her paintings check out my Flora Bowley board on Pinterest). And she’s offering it again at the end of this month, and I wanted to be sure you knew! It’s a five week course jam packed with beauty and inspiration, creativity, soul, color and intuition. 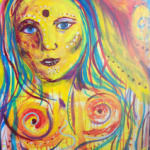 She paints alongside you, and you see the unfurling of two new paintings with great close up shots, whilst being guided through her intuitive painting process, painting with pattern and colour, to create your own expressions of beauty and soul. If you’ve been wanting to get into, or back into painting, learn some new techniques, get out of a rut or just get your creative juices flowing, whether you’re a pro, an absolute beginner or somewhere in between, I really cannot recommend her highly enough. I love her teaching and are so much that I gave my mother a gift of a painting retreat with her for her 60th birthday. This painting adventure will begin on Monday September 30th, 2013, and will run for 5 weeks. Registration for the September, 2013, session is open now. It is a wildly popular course and places are limited so be sure to secure your spot. A heartfelt and uplifting approach to painting that just might change the way you paint forever. PLUS Six months’ extended classroom access, so you can watch the videos and access the lessons as many times as you like during those six months. You want to discover a unique and liberating approach to painting which can translate into all areas of your life. You want to let go, be bold and unfold in ways you’ve never imagined. You are prepared to take risks, be brave and trust in this unique and unknown process (awkward “teenage” stages and all). You are ready to feel the fear of the unknown, but take the leap anyway! You are looking for a course with specific step-by-step painting techniques/instructions that will lead you to a predictable outcome. Although many techniques will be shared in this course, this is much more about discovering a new intuitive approach to creating rather than following specific guidelines — just wanting to be clear on that. This post contains affiliate links – because I share, and sell-e-brate women’s work that I love.